We opted to taste some Loire Valley Sauvignons this month, centered on the Sancerre appellation. 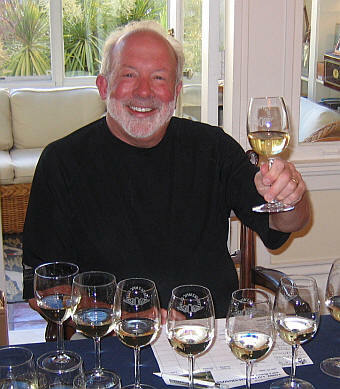 We included a lone Pouilly-Fume and a "mystery" wine made by a New Zealand winery owned by a famous Sancerre estate. The results proved, as usual, interesting. 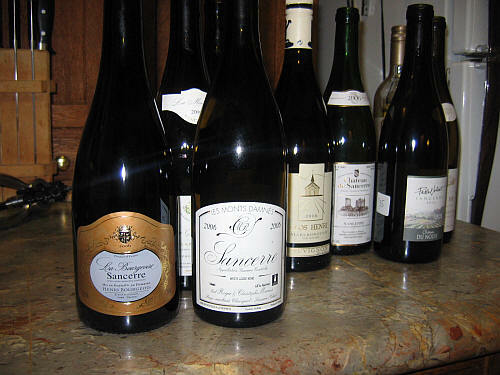 One wine outpaced the group and it comes from a famous vineyard site, Les Monts Damnes. 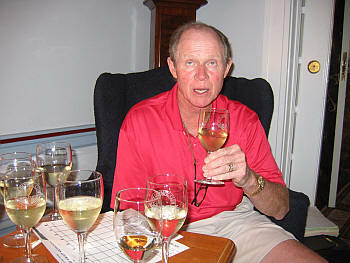 The second place wine was well behind the leader, but well ahead of the rest of the field. Third through fifth were bunched together and, behind that trio were the sixth through eighth place wines. 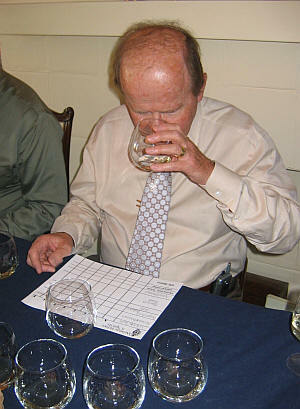 One taster had a remarkably low 'delta', John McGlothlin having a differential of "four" from the group results. 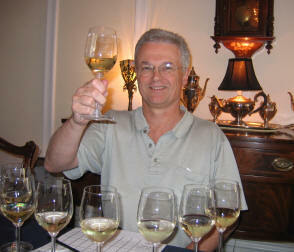 We had wines, predominantly from the 2006 vintage, with the one 2005 being the Pouilly-Fume. Coincidentally, it finished in last place. I did not pick this out as coming from New Zealand...most of the Sauvignons from Marlborough would have stood out, easily, from this bunch of Loire wines. Owned by Henri Bourgeois, this had a lovely hint of citrus, but it was not excessively grapefruity or grassy. There's a hint of a floral note here, as well. I like the citrus flavors of the wine and its crisp edge. The finish seemed to linger for a while, too, making it one of my favorites of the tasting. One-and-a-half stars. Medium straw in color, this wine shows a nicely herbal aspect to its aromas with a bit of a honey-like element. It's dry and crisp on the palate, with nice fruit as well. I found it to be good quality and a perfectly pleasant bottle. One star to one-and-a-half stars. With a clear appearance and a light straw color, Mellot's Sancerre showed hints of hay-like fragrances with a melon note underneath. The wine has a nice level of bracing acidity and it's dry. There's a slightly more minerally or chalky element to this wine compared to most others. I liked it quite a bit. One-and-a-half stars. 4th Place: HENRI BOURGEOIS 2006 SANCERRE "Grande Reserve"
Medium straw in color, this wine was rather "quiet" on the nose. 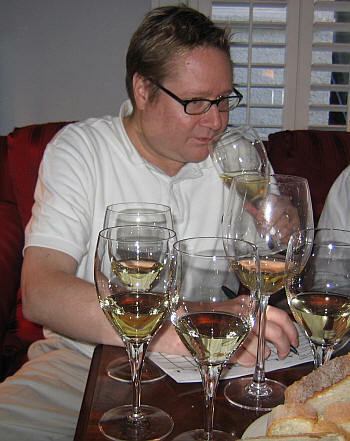 I didn't find much excitement in terms of aromatics or flavor...The wine is dry and crisp, but it simply doesn't rise much above "good" or "correct" alongside the competition. One star. 2nd Place: HENRI BOURGEOIS 2006 SANCERRE "LA BOURGEOISE"
This wine had the most first place votes of the group, but a last place tally and two 7ths sunk this ship. Medium yellow in color, this wine had a lovely nose showing fruit, oak, toasty notes and a bit of a flinty character. It's dry and crisp on the palate. 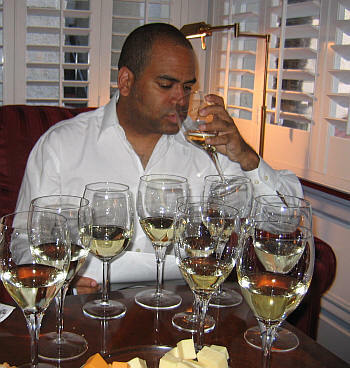 Some tasters may fault the wine for being too "internationally-styled," though it is not heavily oaked. It's dry and crisp with a long and fine finish. Two-and-a-half stars. 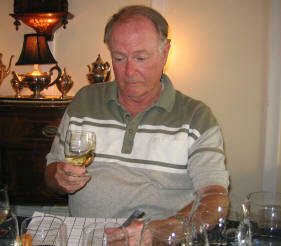 1st Place: ROGER & CHRISTOPHE MOREUX 2006 SANCERRE "Les Monts Damnes"